Wash strawberries thoroughly. Dry carefully by patting gently with paper towels. Place chocolate chips into small, microwaveable bowl with tall sides. Heat bowl in the microwave on High for 30 seconds. Remove bowl; stir chips with spoon. Return bowl to microwave; and continue to microwave on High for an additional 30 seconds; stir. Repeat just until chocolate is melted. 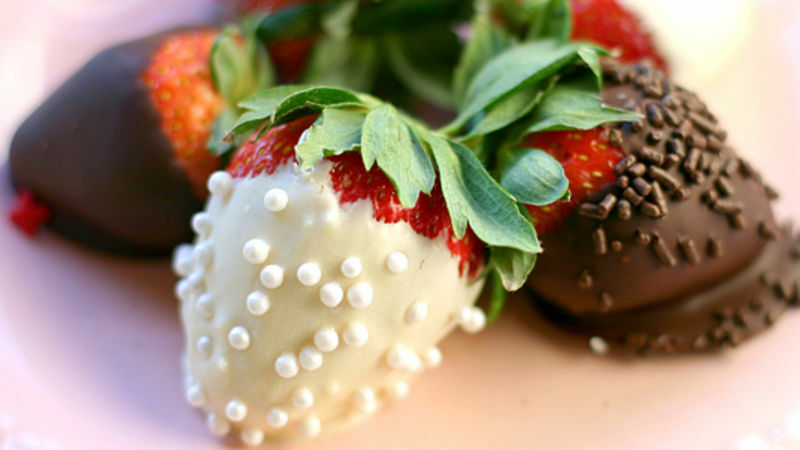 Working with one strawberry at a time, dip into the melted chocolate by holding the stem between your fingers. Slowly pull the strawberry from the chocolate (allowing excess chocolate to run off); place on a piece of parchment paper to dry. Immediately decorate the chocolate-covered strawberry with your favorite sprinkles. Allow the chocolate to cool and harden at room temperature. Serve immediately or store tightly covered in refrigerator for up to 24 hours. Though it may seem like a finicky process, the chocolate will look much nicer and smoother if you don’t over heat it. Follow the directions for microwaving the chocolate just 30 seconds at a time until the chocolate is just melted. Though you might want to rush the process, refrigerating to speed along the hardening of the chocolate may actually cause it to cool too quickly and mottle, or develop white dots or spots. For the freshest strawberries possible, serve within 4 hours of dipping. The chocolate-covered strawberries can be stored in the refrigerator for up to 24 hours, but the fruit will start to weep slightly under the chocolate.